Feng Shui involves many principles for the auspicious (or favorable) positioning of your bed. To take advantage of as many of them as you can, use common sense, along with the conditions of your individual room, to make the best choices possible. For example, Commanding Position concept shows you how to achieve the most powerful bed position according to one Feng Shui school of thought. If you see that your bedroom doesn’t meet these criteria — don’t panic! There are cures you can implement to dramatically enhance your bedroom situation. The first Commanding Position principle states that the position of the bed relative to the bedroom door rates more importantly than the compass direction the bed faces. That is, you don’t analyze whether your bed faces east, west, north, or south. You can rest easy and position the bed according to the way it best relates to the other main feature of the room — the door. The second Commanding Position principle holds that the bed should sit as far from the bedroom door as possible. 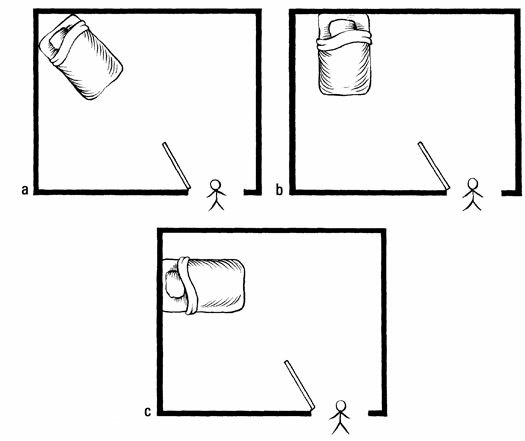 If the door is on the left, the best position is the far right corner of the room; if the door is on the right, the best bed location is the far left of the room; and if the door is the center, the best location is either the far right or far left corner of the room. (See Figure 1.) The farther your bed sits from the door, the more control you can feel over your space and your life. You aren’t startled easily, and you have plenty of time to prepare for events as they unfold. Figure 1: The Commanding Position: Three placement options for your bed. The third Commanding Position principle asserts that the bed position should allow the sleeper the widest possible scope of the room. A diminished range of sight within the room can restrict the sleeper’s chi and his or her life vision. The larger the space in front of your bed, the more your life expands, breathes, and improves. For this reason, Feng Shui cautions against placing the foot of the bed against a wall, which can block your career and cause foot and ankle problems. In addition, placing your bed directly against a side wall (with no space between the side of your bed and the wall) can make you feel cramped, stifled, and less flexible in life. The fourth Commanding Position principle states that you should clearly see the bedroom door from the bed. This concept means that when lying on your back in bed — that is, in the center of the bed (if you sleep alone) or on your side of the bed (if sleeping with a partner) — you can open your eyes and immediately see the door of the room without repositioning your body. If you have to perform gymnastics or create new yoga positions to see who or what’s coming in the door, your bed position does not meet this principle. Not seeing who’s approaching can keep you uncertain and on edge. Even if you think that you’re accustomed to not seeing the door, you still likely experience ongoing subconscious stress, which can create imbalance and frustration. The possibility of always being startled can keep you on edge, and over time, the continual tension and unrest can cause an imbalance in the nervous system. Results can include nervous problems, arrhythmia, and heart palpitations. In addition, repeatedly twisting the body to see whether someone’s coming can cause neck and spinal problems in the long run. If your bed position doesn’t allow you to see the door and you can’t move the bed, you can place a sizable mirror opposite the bed that allows you to easily see the door. If you need to angle the mirror to show the door, use a standing mirror angled to the appropriate position. The farther you sleep from the door and the more of the room you see while in bed, the more you can feel in control of your environment and, therefore, your life. Seeing the door to your bedroom symbolizes that you know what life is bringing and feel prepared to deal with whatever comes. You’re in command, and the results manifest positively in many areas of your life. When following the Commanding Position principle, you can choose from three alternatives for good bed placement. (See Figure 1.) Choices 1-b and 1-c are both excellent; just be sure, if possible, to leave enough room on the side closest to the wall for your partner (or yourself) to get into bed. Position 1-a (the bed angled in the corner) is the strongest choice of all; it gains support from two walls rather than one wall. If you choose this position, then your bed should feature a solid headboard. Make sure the corners of the bed firmly touch the walls. You can strengthen this bed position by placing a plant and a light behind the headboard. (A real or an artificial plant works for this cure, and the light should be in good working order but doesn’t need to be on at all.